The people had grown impatient. They stopped listening to God. They closed their ears to Moses, His messenger. Standing their ground in a rebellion against the Lord and His minister, the Israelites remained in their sin. And judgment came. Poisonous snakes were everywhere. Great crowds of people were bitten and fell ill and died. Others were finally seeing the error of their ways. But what could be done? The irony was not wasted on them. They realized that sin and death entered the world by a serpent enticing our first mother. They were not blind to the image of serpents now overrunning their camp, and doling out death. If a serpent got someone, it was a fatal bite. Death was sure. Crying out, they pleaded with Moses to intercede for them and ask God to remove the deliverers of death. But God’s answer was not to remove the agents of death. The Lord did not take away the hardship and potentially fatal danger. What did He do?! He delivered them from evil! He gave salvation! God told Moses to make a serpent out of bronze. Moses, who received the blame of the people when they were judged by God for their unbelief – Moses, whose fault they said it was that they did not have good food like the good old days when they were slaves and life seemed easier! Now the minister of God who bore their anger and blame was to craft the means of grace that would save the grumbling multitudes. Now, whoever was bitten was to look to that image, and live. 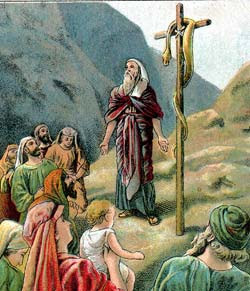 The poisonous snakes did not disappear, but when someone was bitten, they could look to the bronze serpent and not die, but live! The Serpent was lifted up. This sculpture of death became a source of life! The children of Israel were brought to realize that nothing they could do would rid them of the snakes. Yet God Himself could and would deliver them. No Israelite could, by his own reason or strength, save himself. No remedy, medicine, or “snake bite kit” was going to save them. But simply looking in faith toward the Lord’s means of grace would release them from death’s slithering grip. Fourteen hundred years later, Jesus teaches this morning’s Gospel lesson. In Adam, all have fallen and are bitten by the poisonous serpent who brings death. It is a fatal bite. Death is sure. And once again, no one could, by his own reason or strength, save himself. No remedy, medicine, or “snake bite kit” could save anyone. Jesus alone has God’s remedy. What is that remedy? Jesus was lifted up. Just like the strange image of a deadly serpent was used as God’s means to give life, so was this strange, gut-wrenching, lifting up of Jesus on the cross. Here was a man – the Son of Man – dying, lifted up and on display for all to look to. And in His death, He gives life – eternal life. Simply gazing upon our Suffering Servant on that cross, we behold God’s gift of salvation. We are strengthened and comforted, being reminded of God’s boundless love, as He died for you! That is the beauty of the crucifix. 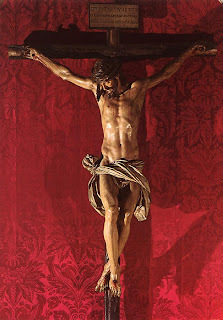 A cross with a picture or sculpture of Jesus on it is a most amazing treasure, preaching to the eyes. With that image, God delivers the Gospel visually, visibly proclaiming salvation. The Church has always recognized this. The Lutheran Church has always cherished this. In some areas of Germany, it was easy to spot the Lutheran churches, because they had the largest crucifixes! They wanted the message of Christ crucified to be boldly proclaimed. And when someone was dying, do you know what Dr. Luther encouraged? He said someone should hold a crucifix before the eyes of the departing Christian, that he could be calmed and assured and comforted by recalling Christ’s sacrifice that they might live. Of course, there are many folks who are uncomfortable about this. People didn’t like the bronze serpent either. It’s gross. Disgusting. Just ask Mary Ann, or Indiana Jones about snakes. Many of us don’t even want to see them in the zoo, much less outside of a glassed-in exhibit. How disturbing that God’s salvation from the poisonous snakes was an image of a snake! Similarly, the salvation from death is an image of death. It is scary. Offensive. Disturbing to the core! Many people do not like seeing Christ on the cross. Be on guard, dear friends in Christ, that if you become leery of seeing a painting or sculpture of Christ on His cross, it does not carry over into an attitude of avoiding Christ crucified! Do not become ashamed of Jesus and His humble death. Do not let Satan celebrate that you constantly fail to lift Jesus up in a positive way, witnessing His love and mercy. Do not despair that you keep thinking how you are responsible with those chief priests, and scribes, and Roman soldiers for Jesus being lifted up on the cross. Jesus is lifted up for you! Jesus is lifted up for you, dear friends in Christ! And after being lifted up on the cross, He was lifted up out of the tomb! Death was not strong enough, it could not keep Him. Since He paid the price of death, it totally lost its power. Jesus was victorious, now glorified and exalted – lifted up! And forty days after that, Jesus is lifted up for you again, as He ascends into heaven, that He may be nearer to you than ever! He lifts up from this earth, that He may be lifted up in Word and Sacrament. the Lord be with you always!” you see Christ lifted up for you. There, lifted in the pastor’s hands. There, lifted by God’s servant for all to see. In a room filled with people suffering from the snake bite of Satan, Jesus is lifted up at the altar for all to see. good fight. And yet, He doesn’t just leave us to battle the devil alone. This Jesus who is lifted up for you now enters you! He places His Body and Blood inside you, that you may be strengthened and preserved in the true faith, to life everlasting! He comes to you and in you that you may be forgiven, enlivened, and saved! In the Holy Eucharist, you receive the ultimate in Jesus being lifted up for you! Come, dear friends in Christ, and be lifted up by Him who is lifted up for you! Christ. Christ lifts you up, today and always!